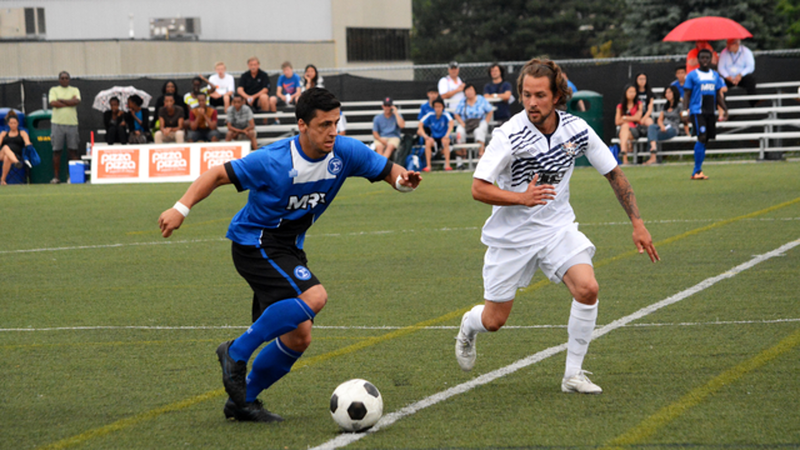 Playing a second game in a matter of days, Sigma FC followed up a 1-1 draw with the Woodbridge Strikers on Thursday night with a 3-0 win over the Windsor Stars on Saturday afternoon. Goals from Emery Welshman, Manny Morgado and Alex Halis highlighted an entertaining game, as two of League1's top teams jockey for position in the standings. This was a comprehensive performance in the eyes of coach Bobby Smyrniotis. "I thought it was good," said Smyrniotis. "We're coming off a game less than forty-eight hours ago that we played against Woodbridge, so it was a quick turn around. Tactically we always have a plan of what we want to do when faced with that situation, and we executed it well." It was the visitors that had a good start to the game early on, with success on the counter-attack, and testing Sigma keeper Greg Ranjitsingh on set plays. Brett Holmberg stood out as a real threat for Windsor, taking on players down the right wing and popping up in dangerous areas, including a header from a corner going just over the bar. Sigma would get on board in the seventeenth minute through a nice piece of ball movement. Halis found fullback Kwame Awuah on one of his many runs down the wing, and Awuah played a low cross towards the back post that Welshman tapped home. The half would end 1-0 to the hosts. One player that was having a particularly good game was Justin Stoddart, finding space down the left wing alongside Awuah, and giving Windsor keeper Kyle Viziraki something to think about. However, his day would end early after taking a hard tackle. "It's tough, he's an important piece to our team, and he almost had a goal when his shot hit off the post," said Smyrniotis. "In the tackle that followed, he got his foot caught underneath the other player. It's probably a sprain, but we sent him straight to the hospital to get checked out and will get the report back soon. Hopefully it's good news." Going into the second half, Viziraki had to come up big on a few occasions, with Welshman, Awuah and Halis each having opportunities on the Windsor goalkeeper. "We're under a new system, new coach and new formation, so it's taking some time to gel," said Viziraki. "I've learned a lot form our No. 1 keeper Anthony Santilli, he helps me out quite a bit and in this game I had to stand on my head somewhat." The hosts would breakthrough again in the fifty-sixth minute, with a foul on Welshman at the top of the box resulting in free kick that was rocketed into the top left corner by Morgado. Viziraki was rooted to the spot. "It's something that I train to do often, and something I enjoy doing a lot," said Morgado. "I picked the spot where I wanted to put the ball. Sometimes it works and sometimes it doesn't, but thankfully it worked this time." Awuah would cap off his man-of-the-match performance by earning a penalty, using his speed to get into the box before being taken down by the Windsor defender. Halis would step up to the spot and hammer home the penalty in the seventy-second minute, effectively ending the contest. Reflecting on his performance in post-match interview, Awuah pointed to the benefits of a gradual build-up over the match. "At first I thought I started off slow, but as the game went on I started to pick it up and my teammates made it easier for me to get into positions to cross the ball," he said. "Coach Bobby knows his tactics and watches every team. He tries to exploit their weaknesses, and I guess today their [Windsor's] weakness was the wings. I have the ability to get back and forth, so using me was a plus and I try my best to provide consistent service." The importance of a fullback like Awuah as a dual threat is something Smyrniotis points out as a useful asset. "He's a modern day outside back," said Smyrniotis. "Today's outside backs - as we saw in the World Cup - have to get forward and be able to provide options during play. He does that fantastically, with great technique on the ball and service from outside, while at the same time taking care of his defensive responsibilities. He was spot-on today, carrying over his performance in the last twenty/ thirty minutes of the Thursday night game against Woodbridge."